Integrated photonics is a powerful platform that can improve the performance and stability of optical systems while providing low-cost, small-footprint, and scalable alternatives to implementations based on free-space optics. While great progress has been made on the development of low-loss integrated photonics platforms at telecom wavelengths, the visible wavelength range has received less attention. Yet, many applications utilize visible or near-visible light, including those in optical imaging, optogenetics, and quantum science and technology. Here we demonstrate an ultra-low-loss integrated visible photonics platform based on thin-film lithium niobate on an insulator. Our waveguides feature ultra-low propagation loss of 6 dB/m, while our microring resonators have an intrinsic quality factor of 11 million, both measured at 637 nm wavelength. Additionally, we demonstrate an on-chip visible intensity modulator with an electro-optic bandwidth of 10 GHz, limited by the detector used. The ultra-low-loss devices demonstrated in this work, together with the strong second- and third-order nonlinearities in lithium niobate, open up new opportunities for creating novel passive and active devices for frequency metrology and quantum information processing in the visible spectrum range. J. C. Bergquist, Frequency Standards and Metrology (World Scientific, 1996), pp. 1–574. J. Kitching, E. A. Donley, S. Knappe, M. Hummon, A. T. Dellis, J. Sherman, K. Srinivasan, V. A. Aksyuk, Q. Li, D. Westly, B. Roxworthy, and A. Lal, “NIST on a chip: realizing SI units with microfabricated alkali vapour cells,” J. Phys. Conf. Ser. 723, 012056 (2016). L. W. Parsons and Z. M. Wiatr, “Rubidium vapour magnetometer,” J. Sci. Instrum. 39, 292–300 (1962). H. Korth, K. Strohbehn, F. Tejada, A. G. Andreou, J. Kitching, S. Knappe, S. J. Lehtonen, S. M. London, and M. Kafel, “Miniature atomic scalar magnetometer for space based on the rubidium isotope 87Rb,” J. Geophys. Res. (Space Phys.) 121, 7870–7880 (2016). S. J. Smullin, I. M. Savukov, G. Vasilakis, R. K. Ghosh, and M. V. Romalis, “Low-noise high-density alkali-metal scalar magnetometer,” Phys. Rev. A 80, 033420 (2009). A. I. Lvovsky, B. C. Sanders, and W. Tittel, “Optical quantum memory,” Nat. Photonics 3, 706–714 (2009). O. Katz and O. Firstenberg, “Light storage for one second in room-temperature alkali vapor,” Nat. Commun. 9, 2074 (2018). D. F. Phillips, A. Fleischhauer, A. Mair, R. L. Walsworth, and M. D. Lukin, “Storage of light in atomic vapor,” Phys. Rev. Lett. 86, 783–786 (2001). E. Shim, Y. Chen, S. Masmanidis, and M. Li, “Multisite silicon neural probes with integrated silicon nitride waveguides and gratings for optogenetic applications,” Sci. Rep. 6, 22693 (2016). E. Segev, J. Reimer, L. C. Moreaux, T. M. Fowler, D. Chi, W. D. Sacher, M. Lo, K. Deisseroth, A. S. Tolias, A. Faraon, and M. L. Roukes, “Patterned photostimulation via visible-wavelength photonic probes for deep brain optogenetics,” Neurophotonics 4, 011002 (2017). P. Muellner, E. Melnik, G. Koppitsch, J. Kraft, F. Schrank, and R. Hainberger, “CMOS-compatible Si3N4 waveguides for optical biosensing,” Procedia Eng. 120, 578–581 (2015). T. Claes, W. Bogaerts, and P. Bienstman, “Experimental characterization of a silicon photonic biosensor consisting of two cascaded ring resonators based on the Vernier-effect and introduction of a curve fitting method for an improved detection limit,” Opt. Express 18, 22747–22761 (2010). I. Goykhman, B. Desiatov, and U. Levy, “Ultrathin silicon nitride microring resonator for biophotonic applications at 970 nm wavelength,” Appl. Phys. Lett. 97, 81108 (2010). I. Aharonovich, D. Englund, and M. Toth, “Solid-state single-photon emitters,” Nat. 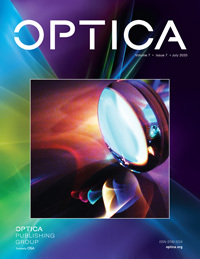 Photonics 10, 631–641 (2016). I. Aharonovich and E. Neu, “Diamond nanophotonics,” Adv. Opt. Mater. 2, 911–928 (2014). Y. Chen, A. Ryou, M. R. Friedfeld, T. Fryett, J. Whitehead, B. M. Cossairt, and A. Majumdar, “Deterministic positioning of colloidal quantum dots on silicon nitride nanobeam cavities,” Nano Lett. 18, 6404–6410 (2018). Y.-S. Park, S. Guo, N. S. Makarov, and V. I. Klimov, “Room temperature single-photon emission from individual perovskite quantum dots,” ACS Nano 9, 10386–10393 (2015). J. Kern, I. Niehues, P. Tonndorf, R. Schmidt, D. Wigger, R. Schneider, T. Stiehm, S. Michaelis de Vasconcellos, D. E. Reiter, T. Kuhn, and R. Bratschitsch, “Nanoscale positioning of single-photon emitters in atomically thin WSe2,” Adv. Mater. 28, 7101–7105 (2016). Y. Gong and J. Vučković, “Photonic crystal cavities in silicon dioxide,” Appl. Phys. Lett. 96, 031107 (2010). P. Muñoz, G. Micó, L. A. Bru, D. Pastor, D. Pérez, J. D. Doménech, J. Fernández, R. Baños, B. Gargallo, R. Alemany, A. M. Sánchez, J. M. Cirera, R. Mas, and C. Domínguez, “Silicon nitride photonic integration platforms for visible, near-infrared and mid-infrared applications,” Sensors 17, 2088 (2017). S. Romero-García, F. Merget, F. Zhong, H. Finkelstein, and J. Witzens, “Silicon nitride CMOS-compatible platform for integrated photonics applications at visible wavelengths,” Opt. Express 21, 14036–14046 (2013). E. Shah Hosseini, S. Yegnanarayanan, A. H. Atabaki, M. Soltani, and A. Adibi, “High quality planar silicon nitride microdisk resonators for integrated photonics in the visible wavelength range,” Opt. Express 17, 14543–14551 (2009). M. Khan, T. Babinec, M. W. McCutcheon, P. Deotare, and M. Lončar, “Fabrication and characterization of high-quality-factor silicon nitride nanobeam cavities,” Opt. Lett. 36, 421–423 (2011). P. Latawiec, V. Venkataraman, A. Shams-Ansari, M. Markham, and M. Lončar, “Integrated diamond Raman laser pumped in the near-visible,” Opt. Lett. 43, 318–321 (2018). B. Sotillo, V. Bharadwaj, J. Hadden, S. Rampini, A. Chiappini, T. Fernandez, C. Armellini, A. Serpengüzel, M. Ferrari, P. Barclay, R. Ramponi, S. Eaton, B. Sotillo, V. Bharadwaj, J. P. Hadden, S. Rampini, A. Chiappini, T. T. Fernandez, C. Armellini, A. Serpengüzel, M. Ferrari, P. E. Barclay, R. Ramponi, and S. M. Eaton, “Visible to infrared diamond photonics enabled by focused femtosecond laser pulses,” Micromachines 8, 60 (2017). L. Li, T. Schröder, E. H. Chen, H. Bakhru, and D. Englund, “One-dimensional photonic crystal cavities in single-crystal diamond,” Photon. Nanostruct. Fundam. Applic. 15, 130–136 (2015). P. Rath, S. Ummethala, C. Nebel, and W. H. P. Pernice, “Diamond as a material for monolithically integrated optical and optomechanical devices,” Phys. Status Solidi 212, 2385–2399 (2015). J. T. Choy, J. D. B. Bradley, P. B. Deotare, I. B. Burgess, C. C. Evans, E. Mazur, and M. Lončar, “Integrated TiO_2 resonators for visible photonics,” Opt. Lett. 37, 539–541 (2012). C. Xiong, W. H. P. Pernice, X. Sun, C. Schuck, K. Y. Fong, and H. X. Tang, “Aluminum nitride as a new material for chip-scale optomechanics and nonlinear optics,” New J. Phys. 14, 095014 (2012). R. S. Weis and T. K. Gaylord, “Lithium niobate: summary of physical properties and crystal structure,” Appl. Phys. A 37, 191–203 (1985). P. Rabiei and P. Gunter, “Optical and electro-optical properties of submicrometer lithium niobate slab waveguides prepared by crystal ion slicing and wafer bonding,” Appl. Phys. Lett. 85, 4603–4605 (2004). M. Zhang, C. Wang, R. Cheng, A. Shams-Ansari, and M. Lončar, “Monolithic ultra-high-Q lithium niobate microring resonator,” Optica 4, 1536–1537 (2017). C. Wang, M. Zhang, X. Chen, M. Bertrand, A. Shams-Ansari, S. Chandrasekhar, P. Winzer, and M. Lončar, “Integrated lithium niobate electro-optic modulators operating at CMOS-compatible voltages,” Nature 562, 101–104 (2018). A. Rao, A. Patil, P. Rabiei, A. Honardoost, R. DeSalvo, A. Paolella, and S. Fathpour, “High-performance and linear thin-film lithium niobate Mach-Zehnder modulators on silicon up to 50 GHz,” Opt. Lett. 41, 5700–5703 (2016). A. J. Mercante, S. Shi, P. Yao, L. Xie, R. M. Weikle, and D. W. Prather, “Thin film lithium niobate electro-optic modulator with terahertz operating bandwidth,” Opt. Express 26, 14810–14816 (2018). C. Wang, M. Zhang, R. Zhu, H. Hu, and M. Loncar, “Monolithic photonic circuits for Kerr frequency comb generation, filtering and modulation,” Nat. Commun. 10, 978 (2019). M. Zhang, B. Buscaino, C. Wang, A. Shams-Ansari, C. Reimer, R. Zhu, J. Kahn, and M. Loncar, “Broadband electro-optic frequency comb generation in an integrated microring resonator,” arXiv:1809.08636 (2018). C. Wang, X. Xiong, N. Andrade, V. Venkataraman, X.-F. Ren, G.-C. Guo, and M. Lončar, “Second harmonic generation in nano-structured thin-film lithium niobate waveguides,” Opt. Express 25, 6963–6973 (2017). R. Luo, Y. He, H. Liang, M. Li, and Q. Lin, “Highly tunable efficient second-harmonic generation in a lithium niobate nanophotonic waveguide,” Optica 5, 1006–1011 (2018). R. Geiss, S. Saravi, A. Sergeyev, S. Diziain, F. Setzpfandt, F. Schrempel, R. Grange, E.-B. Kley, A. Tünnermann, and T. Pertsch, “Fabrication of nanoscale lithium niobate waveguides for second-harmonic generation,” Opt. Lett. 40, 2715–2718 (2015). R. Luo, Y. He, H. Liang, M. Li, and Q. Lin, “Semi-nonlinear nanophotonic waveguides for highly efficient second-harmonic generation,” Laser Photon. Rev., 1800288 (2019), Early View. Z. Hao, J. Wang, S. Ma, W. Mao, F. Bo, F. Gao, G. Zhang, and J. Xu, “Sum-frequency generation in on-chip lithium niobate microdisk resonators,” Photon. Res. 5, 623 (2017). A. A. Savchenkov, A. B. Matsko, D. Strekalov, V. S. Ilchenko, and L. Maleki, “Enhancement of photorefraction in whispering gallery mode resonators,” Phys. Rev. B 74, 245119 (2006). C. Zhang, L. R. Dalton, P. Rabiei, and W. H. Steier, “Polymer micro-ring filters and modulators,” J. Lightwave Technol. 20, 1968–1975 (2002). Z. Wang, Z. Fan, J. Xia, S. Chen, and J. Yu, “1×8 cascaded multimode interference splitter in silicon-on-insulator,” Jpn. J. Appl. Phys. 43, 5085–5087 (2004). S. H. Tao, Q. Fang, J. F. Song, M. B. Yu, G. Q. Lo, and D. L. Kwong, “Cascade wide-angle Y-junction 1 × 16 optical power splitter based on silicon wire waveguides on silicon-on-insulator,” Opt. Express 16, 21456–21461 (2008). H. Yamada, T. Chu, S. Ishida, and Y. Arakawa, “Optical directional coupler based on Si-wire waveguides,” IEEE Photonics Technol. Lett. 17, 585–587 (2005). X. Zhang and T. Miyoshi, “Optimum design of coplanar waveguide for LiNbO/sub 3/optical modulator,” IEEE Trans. Microw. Theory Tech. 43, 523–528 (1995). D. Janner, M. Belmonte, and V. Pruneri, “Tailoring the electrooptic response and improving the performance of integrated LiNbO3 modulators by domain engineering,” J. Lightwave Technol. 25, 2402–2409 (2007). G. C. Bjorklund, M. D. Levenson, W. Lenth, and C. Ortiz, “Frequency modulation (FM) spectroscopy,” Appl. Phys. B 32, 145–152 (1983). Fig. 1. (a)–(c) Finite element simulation of TE00 waveguide mode near three different wavelengths: 635 nm, 850 nm, and 1550 nm; wW=480 nm is waveguide width and wT=120 nm is LN slab thickness. (d) False-color SEM micrograph of the waveguide cross section. (e) 2D AFM scan on LN waveguide. (f) AFM line profile of LN waveguide. Fig. 2. (a) SEM micrograph of a fabricated microring resonator (radius=100 μm). (b) SEM image of the coupling region. Fig. 3. (a) Measured transmission spectrum of TFLN microring cavity near 635 nm wavelengths. (b)–(d) Fit of the resonance dips to Lorentzian function at wavelengths of 637 nm, 730 nm, and 800 nm, respectively. Experimental data shown as blue dots and fit function shown as red line. Fig. 4. (a) Mask layout of fabricated device. (b) Measured transmission of cascaded Y-splitter tree as a function of number of Y-splitter branches. The orange line shows a linear fit with a slope of −3.21 dB/splitter. (c) Dark field optical microscope image of the unbalanced MZI. Scale bar: 50 μm. (d) Measured transmission spectrum of the MZI showing extinction ratios of ∼30 dB. Inset: SEM micrograph of Y-splitter section. Scale bar: 2 μm. Fig. 5. (a) Optical image of the fabricated LN amplitude modulator. (b) Measured normalized transmission versus applied DC voltage showing a half-wave voltage of 8 V for a 2-mm-long device at a wavelength of 850 nm. Measured electro-optical response of the amplitude modulator. (c) The 3-dB cutoff frequency is ∼10 GHz, limited by the detector. Inset: Measured electrical insertion loss (S21 parameters) shows an electrical (3-dB) bandwidth of 17 GHz.